Just got back my trip to Valle De Guadalupe, Mexico and finally sharing some of the looks I wore there, including these adorable overalls. I think this outfit is perfect for weekend trips, winery trips or outdoor fun activities like concerts and fairs. It’s a chic way to throw together a casual but stylish look with overalls. Since I’m a girly girl (I’m sure you already know about this me by now), I decided to wear a black lace bandeau top underneath to pull the look together. It adds a hint of sexiness without showing too much skin. I recommend shying away from bulky or oversized tops underneath slouchy, roomy overalls. Crop tops, lace tops, bralettes, off-the-shoulder shirts and frilly details will help balance out the more masculine silhouette. I went for cute sandals with this look because this is a sweet and girly next door type of look and I don’t think high heels would go with the casual feel. 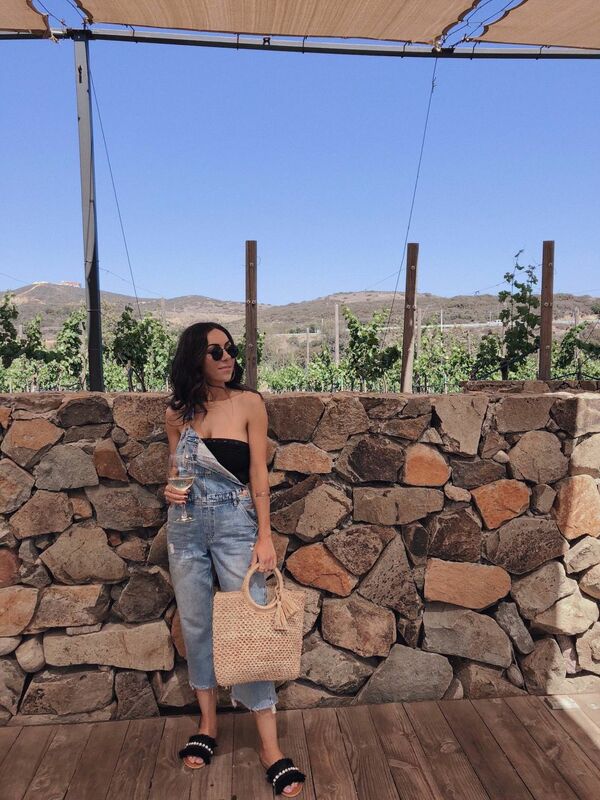 Plus I wore this outfit to a winery in Mexico, and I don’t think high heels are safe for wine tastings 🙂 If you’re planning to keep the rest of the outfit pretty simple like I did, find those embellished sandals that you thought you’d never have a chance to style. Today is the day to wear those babes! I can already see myself wearing sneakers with these overalls on my trips this summer. I’m sure it will make a comfy flight outfit as well. If you’re going for a farmer girl look like me, a simple straw bag is a must! Backpacks, crossbody bags, and handle bags are other options. I added round sunnies, simple rings, and a subtle touch of shine with a pair of gold hoop earrings to complete this look. I wouldn’t go for a statement necklace or big jewelry, but if you feel like it – go for it! I also had an oversized cardigan with me to layer since you never know when it might get chilly. If you’re on the shorter side like me, opt for a petite/short style or cuff the legs for a more balanced look. You don’t want to look like you’re drowning in your outfit. Some skin at the hems makes the look airy, comfy and well fitted. River island makes petite versions of a ton of their pieces, and I usually shop from that section on their website. If you have a longer or shorter torso, try and find a pair of overalls with adjustable straps, so there is no gapping or pulling in the crotch area. So what do you guys think? Do you like my laid-back take on denim overalls? Get 20% off a full price order from @riverisland with code ‘4THJULY’ till Wednesday, July 4th! This post is in partnership with River Island, which is one of my favorite brands. All opinions are my own.